Okay, a philosophical question: Is there such a thing as an everyday carry pistol that is too small, too light and too easy to shoot? The last one, absolutely not. But the other two, now they are matters of opinion. I feel it is possible to get an everyday carry pistol that is too small and too light, and if you have it chambered in a full-power cartridge, it can be a bear to shoot. I found the new Kahr S9 to be a Goldilocks pistol: just the right size, just the right weight and just the right amount of 9mm ammo. If you're not familiar with Kahr, the company makes single-stack pistols with double-action trigger mechanisms. The firm started off with steel-frame guns but eventually switched to polymer. The new S9 is Kahr in every way- a polymer-frame single-stack semiauto with a double-action trigger- but it adds a few touches that make it an even better carry pistol. And for less money. Before I get to the details, there are a few things worth addressing. One, some people scoff at single-stack guns and say a double-stack pistol isn't hard to conceal and gives you a lot more shots. I'll grant you the capacity of a double-stack pistol can be beneficial, and they're not hard to conceal. But they are hard to live with. One of the big improvements found in the S9 is the presence of an accessory rail for lights and lasers, a feature other Kahr models lack. Mark my words: If you stick with a high-capacity pistol long enough, you'll be like the rest of us old-timers and be really sensitive to the aches and pains of carrying a pistol. You'll be going back to a single-stack just to reduce the frequency of visits to your chiropractor. Also, Kahr's double-action trigger isn't what you usually think of when you hear the term. It isn't a double-action hammer design but rather a double-action pull that loads a striker against its action spring. The design eliminates stacking- a phenomenon inherent to hammer-fired double actions in which the leverage working on the hammer changes, which leads to changes in the force needed. The system "stacks," or is heavier to pull, at some point along the trigger pull path. The Kahr design cams a striker back in a straight line. The leverage of the system does not change, and the trigger stroke is the same all the way back, from start to finish. Now, back to the new S9. The gun is part of Kahr's value series, which includes the CT and CW pistols, but it incorporates new features and also takes advantage of design and production changes to lower the cost. With its double-action pull, the Kahr has no need for a manual safety, so controls are composed of just a slide lock lever and a mag release. The S9 is a compact 9mm pistol with a seven-round magazine and a 3.6-inch barrel. For this gun Kahr dispensed with its dot-over-bar sights in favor of a traditional three-dot design. The front sight is a polymer blade that's pinned to the slide, while the rear is steel and inserted into a transverse dovetail. The slide has been given a new contour. The new shape is easier (and therefore less expensive) to machine, and it has a sleek and business-like look. It features an aggressively beveled front end for easy holstering. Also new are the forward cocking serrations so you can do a press-check in the proper way: with your off hand underneath the frame, reaching up to pull the slide back. Gone are the sculpted curves on the top corners of the slide. Instead, the S9 has flat sides, a flat top and a simple bevel on the corner. Kahr pistols do not use a barrel bushing to contain the barrel, so the front of the slide is flat, with the crown protruding just slightly. The blued steel recoil spring guide rod underneath the barrel is flush with the slide face. While the slide is guided by the polymer rails molded into the polymer, the brunt of the work is borne by steel inserts. Those inserts are at the rear of the frame, and in the manufacturing process they are held in the mold while the polymer is injected and cured. In addition to the non-slip rectangular pattern on the frontstrap and backstrap, the sides of the S9's grip are stippled for sure purchase. The barrel tells us the S9's heritage, as it is marked "9x19 CW." Like the CW, the S9 lacks a loaded-chamber indicator. State-mandated safety feature requirements aside, since the S9 has forward serrations for performing a press-check, you probably don't need a chamber indicator. The S9 has an accessory rail on the frame for a light, laser or combo unit. Given the compactness of the S9, you will find that some of the larger lights and lasers will probably be a bit bulky when bolted onto the pistol. Smaller units will probably prove a better match. The dust cover portion of the S9's frame incorporates a set of molded-in rails that match up with slots machined in the slide. These rails provide both rigidity to the dust cover and alignment for the slide in the frame as the gun cycles. The S9 doesn't have a manual safety, so the only controls you'll find are the magazine release button directly behind the trigger guard and the slide stop lever just above it. The S9 frame has an aggressive rectangular non-slip pattern on the frontstrap and the backstrap. Kahr has molded in a skateboard-tape-like texture on the sides of the grip portion of the frame. That texture panel is interrupted for the Kahr logo. On previous guns Kahr placed the serial number plate on the dust cover, but with the addition of the accessory rail on the S9, the plate has been moved to the left side of the grip. The Kahr is a small, light gun, but its dimensions allow a full three-finger grip, which makes shooting it relatively easy. The S9 magazines also come with a new magazine base plate. It's large enough on the S9 to aid in getting a firm grip on the pistol while being small enough to not be an extra detail hindering concealed carry. Disassembly is simple, if a bit fussy. There is a small mark on the slide, machined into the base of the rear-most vertical of the forward serrations. On the frame you'll find a small, molded-in indentation. Unload the S9, remove the magazine, and pull back the slide until those two marks are aligned. Press out the slide stop. It is retained by a relatively stiff spring, and if the two marks are the least bit misaligned, the stop won't want to come out. You might have to tap it with some non-marring tool to coax it into movement. Once you learn the touch, it is easy, but the first few times might be a struggle. With the slide stop out, things proceed normally. Ease the slide forward until it stops. Dry-fire it, releasing the striker, and pull the slide assembly off the frame. Lift the recoil spring guide rod out of the slide, and then the barrel. The recoil spring and rod are not a captured assembly, so be careful not to launch the guide rod. This is as far as you need to go. Scrub the grubby parts clean or drop it all in an ultrasonic cleaner. Just make sure you use a solution safe for polymer frames. Lube all the usual wear/friction points. A drop of oil in the striker assembly is all you need. The size of the S9 puts it firmly in the camp of "more than one use." While it is really compact, the S9 is not so small you would be hampered by its size as a main or sole carry gun. And at the same time it is so small that if you were using a larger pistol as your main gun, the S9 as a backup would not be an anvil. As I said, the S9 is a Goldilocks gun. The short 3.6-inch barrel in the S9 might lead some to believe velocities would suffer. Purely as a coincidence, I had along another 9mm pistol with a four-inch barrel to test on that range trip, and I compared their speeds. When the Kahr was behind, it was behind by no more than 20 to 30 fps, and with some loads the Kahr generated the same or slightly higher velocities than the four-inch barrel of the other pistol. This is because more ammunition makers are creating loads that perform best out of short barrels- and one reason you're not handicapping yourself with a small carry gun these days. Where the S9 had the bad luck was in barrel length in our tests. Handguns' test protocol is simple: At 3.5 inches or less, we test at 15 yards; beyond that, we test at 25 yards. So the compact S9 had the burden of being tested at 25 yards, where a similar pistol with a barrel a tenth of an inch shorter would get the benefit of the shorter test distance. Not that the S9 had anything to worry about. The accuracy results are good by any standard and pretty darned good for a pistol that almost qualifies as a pocket pistol. The S9 comes in a padded box with two magazines, owner's manual, lock and registration card. Two magazines are plenty for a lot of shooters, giving you one in the gun and a spare on your belt while you are carrying. If you want extras, Kahr has a full line of magazines for all their pistols. The price might seem a bit much at $44 per mag, but these are quality magazines. 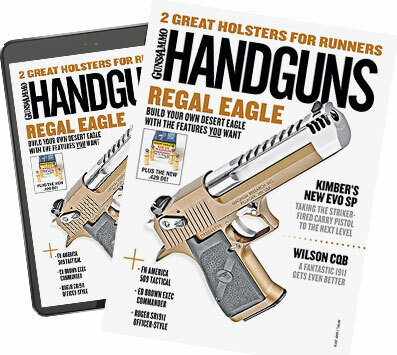 You can find really inexpensive magazines for other pistols, but the question you have to ask yourself is this: What do you get for a no-name magazine that costs you $12? In a lot of instances, you get headaches. Given that a top-quality magazine for bigger-name pistols costs at least as much as what a Kahr magazine does, I don't begrudge them $44 each. In the course of chronographing and accuracy testing the S9, I fired more than 400 rounds of ammo, and I didn't have a single failure to feed, fire, extract or eject. And the ejection was impressive. I had to move my car to keep it from being struck by the S9's brass. You have no fears that the empties will be dispatched out of your AO, and there is no chance they will hang around to cause problems in feeding. Notes: Accuracy results the average of five, five-shot groups, over a Sinclair shooting rest, at 25 yards. Velocity is the average of 10 shots, measured by a LabRadar chrono, programmed to measure velocity 15 feet from the muzzle. Abbreviations: BJHP, brass-jacket hollowpoint; FMJ, full metal jacket; JHP, jacketed hollowpoint. You might think a 9mm pistol weighing just under a pound would bring harsh recoil. Not the case. Oh, you get some recoil, unlike a four-pound competition pistol, but you will not find yourself in the second magazine of a practice session asking "When will I be finished?" More likely it will be "Where did all the ammo go?" The soft recoil is accomplished in part by means of a stout recoil spring. The S9 is not the pistol to select if you have problems pulling the slide back to chamber a round in your everyday carry pistol. But if you do choose it, there are many holster makers who carry models that will fit it. The S9 and a spare magazine on your belt gives you 15 rounds of 9mm emergency-solving options. Between its light weight and a suggested retail of under $500 it will neither be tugging your belt down nor emptying your wallet.